Remote control for iPod nano from Brightonnet Corporation. Brightonnet Corporation has come out with a wired remote control- BI-NRECON for iPod nano.The remote control is available in 2 colors, black and white. 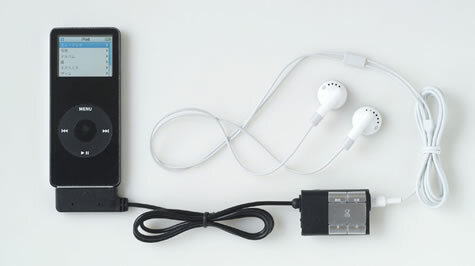 The wired remote control is connected in the dock connector and ear phone terminal of iPod nano. There is a hold button on the lower end of the remote. Operations like volume control, play/pause, stop, reset etc is possible with the remote. On the rear of the remote you have the clip to attach to a bag, dress etc.The Brightonnet BI-NRECON remote measures 36×27×8mm, weighs 20g and comes with a 60cm length cable. The remote will be available from July 7th for approximately 1,480 Yen ($13).